Cats are good at hiding any type of illness, by being quiet and hiding, You may not be fully aware that something is wrong since cats can be experts at hiding pain or discomfort. By nature, cats are independent animals, however they still need to be examined by a veterinarian on a at least a yearly basis. As a cat owner, you should be aware of any changes in eating habits, playfulness and general overall health. If you notice any changes in behavior, such as a change in eating habits, not greeting you the way they normally would, reluctance to jump up or move around the way they typically would… these are the subtle signs of what could be a serious health problem, and it is time to schedule a veterinary exam. At Willard Veterinary clinic, we recommend performing basic lab tests at least once a year, as well as reviewing nutrition and any behavioral issues you may be noticing. Of course, we realize that some cats don’t like getting into the cat carrier and going for a ride. In these circumstances, we recommend coaxing your cat into his carrier by using a treat, and trying to soothe your kitty during the car ride. 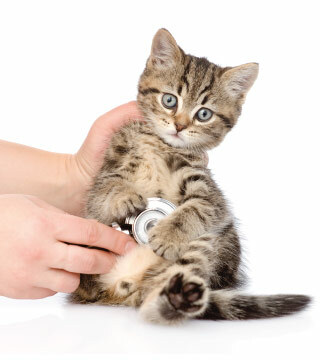 What Is Involved In A Cat Wellness Exam? Cats should have a thorough dental cleaning around age 4. We will do a dental exam and look for any abnormalities in the mouth. By age 4 virtually all cats have some kind of painful dental issue. In addition to problems with their teeth, cats can develop tumors inside of their mouths and since they are so adept at hiding pain, especially dental pain, it is very easy to overlook these issues. However, make no mistake, dental issues are painful and seriously affect the quality of life. At Willard Veterinary clinic we assess the body condition of the cat, and determine if he is the correct weight. A wellness exam also includes palpating the abdomen for organ size making sure that all is normal and checking for any lumps or bumps. We will also collect urine and blood samples for yearly labs. Preventative care is extremely important, along with vaccines, parasite control and deworming. This is the time to bring up any issues you are not sure about. If you notice that your cat coughs a lot and you think it may be a hairball, mention this to your vet. Some cats are prone to asthma, a condition that can be diagnosed and treated to improve the quality of life for your cat. How Often Should Cats Be Examined? Your cat should be examined at least once per year. You may not be aware that kitty is not feeling well, and it’s better to stay one step ahead of any potential medical issues. Older or geriatric cats should have a semi-annual (twice yearly) wellness exam. Why Might Additional Tests Be Recommended? Cats age much quicker than we do, so doing yearly labs are advised. Cats can be prone to kidney disease a condition we see quite often. If we can catch the kidney disease early, we may be able to change their diet to control or reverse it to improve their quality of life. We will also check your cat for intestinal parasites by checking a stool sample. Depending on the condition of your cat, any symptoms you have noticed, concerns you have or test results, diagnostic imaging may also be recommended when appropriate to provide our doctors with the information necessary to make an accurate diagnosis and come to a recommendation for treatment.